Matthew D. Dubin has practiced law in Washington since 1995. During the past 20 years he has helped thousands of people and families affected by almost every type of personal injury claim imaginable. Matt attended Yale University, where in 1990 he received his Bachelor of Arts Degree in History. After working briefly for the law firm of Boyle, Vogeler & Haimes in New York City, he moved to Seattle and enrolled in law school. Three years later he received his Juris Doctor degree from the University of Washington. In 1995 he was admitted to the Washington Bar and began his law practice. Matt is the founder of the Law Offices of Matthew D. Dubin. His main practice areas of concentration include all areas of personal injury law. Although most of his cases are resolved prior to trial, Matt has always believed that the only way an insurance company will pay fair compensation for a claim is if they see that the plaintiff is ready to try the case to a jury. Matt has consistently given back to the legal community by being an active member of the American Association for Justice and the Washington State Association for Justice (WSAJ), in which he has been an Eagle member since 2011. Matt has published articles on topics including dog bite law, distracted driving, traffic fatalities, bicycle safety, dangerous household products, traumatic brain injuries, health insurance, pedestrian safety, risks facing teenage drivers and more. On the personal side, Matt has been a tenor with the Seattle Symphony Chorale, the official choral group of the Seattle Symphony, since 2000. He is a coach with the North Seattle Baseball Association and he is a member of the Haller Lake Community Club in North Seattle. He enjoys hiking, camping and attending sporting events with his wife Elizabeth and his son Abraham. Maximizing Your Injury Claim: Simple Steps To Protect Your Family After An Accident is a non-fiction self-help book written by Matthew D. Dubin. The author does not show you how to pursue your own injury claim; rather his book is designed to instruct the reader on personal injury actions, discuss legal representation and illustrate the steps necessary to get fair compensation when you're injured. He recommends that drivers take a second look at the insurance they're carrying on their vehicles, and he gives recommendations for minimum coverage amounts. He explains why this is crucially important and how your PIP coverage can help pay for medical bills after an injury, whether you are in your car or not. Dubin discusses what you should and should not do at the scene of an accident, and then shows you what to expect and do at each step in the process of resolving your claim. He also demonstrates what you can and should expect from the lawyer you select to pursue your claim. Matthew D. Dubin's educational self-help book, Maximizing Your Injury Claim: Simple Steps To Protect Your Family After An Accident, describes the entire compensation process starting from even before you have that accident or injury. His discussion on insurance coverage had me double-checking my policy and considering whether I should go for more coverage. I really appreciated his cautions on speaking to claims adjusters right after an accident. Most people feel there's nothing to hide or to lose from an honest question and answer session and are eager to get things going, but the author shows how this can work against your best interests. Dubin discusses legal representation and how he feels that a personal injury lawyer's job is to take care of the details while you get better. He discusses an attorney's obligations and what a client should expect from his or her counsel. I was most impressed with this informative and helpful book. Dubin clarifies a convoluted and often confusing legal process, and he does so in language and with anecdotal examples that are written with the layperson in mind. Maximizing Your Injury Claim: Simple Steps To Protect Your Family After An Accident is most highly recommended. Maximizing Your Injury Claim: Simple Steps To Protect Your Family After An Accident by Matthew D. Dubin is a comprehensive book on insurance claims and the various do’s and don’ts involved in the process of filing a claim. Maximizing Your Injury Claim is divided into several chapters on various subjects such as understanding auto insurance and personal injury claims, what to do and not to do at the scene of the accident, how to gather all information and documentation, how to talk and negotiate with insurance companies, how to find the right lawyer if necessary and the steps to follow if you decide to go to court, and finally how to handle and take care of the medical problems that may arise. There is also a detailed and very useful section on FAQs on relevant topics such as motorcycle accidents, car accidents, commercial truck accidents, disc herniation, etc. Maximizing Your Injury Claim: Simple Steps To Protect Your Family After An Accident by Matthew D. Dubin is an extremely useful book to keep handy. The information on insurance and its intricacies is very pertinent, especially in today’s day and age, and is something that every person necessarily should familiarize themselves with. I liked how the book was organized and all of the chapters were categorized in such a way that it made a somewhat complicated subject simple and easy to understand. The writing is very clear and direct, and written in an engaging tone. Maximizing Your Injury Claim is a must-read book for everyone. Maximizing Your Injury Claim: Simple Steps To Protect Your Family After An Accident by Matthew D. Dubin is designed to give one general information regarding personal injury claims and lawsuits. It begins with a discussion on personal injury claims, auto insurance coverage, and concrete steps to protect your family in the event of an accident. Matthew introduces one to the scene of an accident, including the steps one must always take to optimize your claim, and the things to avoid. One will learn about rights and what you should expect after hiring a lawyer. It also explains in simple steps how to increase the payment for a damaged or totaled vehicle. Quite significantly, the book covers the dangers of social media and how to avoid sabotaging one's claim on Facebook. It also discusses the variety of options available to get all of the medical treatment bills settled. Maximizing Your Injury Claim: Simple Steps To Protect Your Family After An Accident by Matthew D. Dubin is a complete guide, covering all aspects of injury or accident and claims. With the help of FAQs and a glossary of terms, it makes using this book very easy. Trials, as well as the available options to settle the case without a trial, are discussed. This book thus gives a thorough overview of the legal aspects of an injury, offers practical advice on how a decision on a claim should be reached, and provides valuable advice about what to do next. This is a very good reference and a companion guide to get one's life back to normal. Vehicles are an essential part of our everyday life. Unfortunately, they come with a great risk of accidents and, however much one might try to be careful, accidents still do happen, many times leaving one incapacitated or unable to live the full life they used to. So, as we do everything we can to avoid accidents, we also need to be prepared, just in case. In Maximizing Your Injury Claim: Simple Steps To Protect Your Family After An Accident, Matthew D. Dubin provides a detailed step by step guide on how to handle this unfortunate situation. The book guides you on what to do from the moment the accident happens through to the very end of this scary and exhausting process. This way you can avoid the many mistakes that people make which give insurance companies excuses not to settle their personal injury claims. 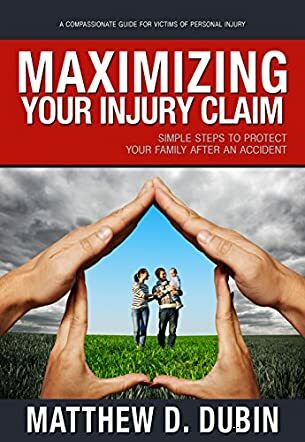 Maximizing Your Injury Claim: Simple Steps To Protect Your Family After An Accident by Matthew D. Dubin is an insightful book that equips one with useful knowledge, with tips, steps, and the dos and don'ts of any personal injury claims. It is very detailed and practical, and Matthew D. Dubin wrote it in a way that makes it fairly easy for the average person to grasp. He writes from his years of experience with personal injury cases and this easily comes out in the way he presents the information. Personal injury claims are usually a nightmare for the victims and their families, but he broke this formidable topic down in a way that made sense. I was really impressed. I felt I understood the process after reading the book and now feel more confident to deal with this, should that unfortunate day come, or help a dear one dealing with it. Via this book, Matthew D. Dubin is in a way holding your hand through what could have been your worst nightmare by making it easier for you to deal with it. It is a must-read for everyone because you just never know when you will need this information for yourself or to help someone else. Maximizing Your Injury Claim: Simple Steps To Protect Your Family After An Accident by Matthew D. Dubin teaches you all that you need to know about personal injury claims. In this fast paced world, at least one person you know has been in an accident. Automobile accidents are more common these days than they used to be, despite all the precautions we take. The chances of filing a personal injury lawsuit are greater than they ever were before. It is always better to know as much about personal injury claims as possible. In Maximizing Your Claim, you will learn about what you should expect while going for a personal injury claim. You will get to know your rights, how to approach the insurance companies, what kind of data should be collected at the accident scene, how to approach the authorities, and everything that you must be aware of. From your medical bills to appearances in court, everything is described in this book in a manner that you will appreciate. Matthew D. Dubin has written a great self-help book that will surely enable you to understand and prepare for the time when you will have to fight for your rights. The author has described everything in layman's terms, so that you will not have to reach for your dictionary to understand all that legal jargon. Many attorneys are reluctant to tell you the truth or give you half truths because they believe they can make easy money through your case. This book has simple and honest advice for people to know the truth and avoid the scammers. Thanks for the great review. Please note that this book is most definitely not just for people who have already been involved in an accident. It is essential that people educate themselves on insurance coverage and what to do at the scene of an accident BEFORE the accident ever takes place. I believe this book contains essential information for anyone who drives or uses the road as a pedestrian, and even for people who use mass transit. Maximizing Your Injury Claim is a “must-read” book for absolutely everyone. If you drive a car, ride in a vehicle, or even walk and have to cross a street, you need to read this book. It would be difficult to find anyone alive today who has not been in some sort of automobile accident, so it’s best to be prepared before that happens or it happens again. Matthew Dubin has been a personal injury lawyer for twenty years. He has practiced in Washington State during that time, owns his own law firm, and has received many honors, including being named A National Trial Lawyers Top 100 Lawyer. More importantly, as the pages in Maximizing Your Injury Claim demonstrate, he cares deeply about his clients and getting them the settlements they need and deserve when they are injured. Not only does he care about his clients, but he knows all the ins and outs of dealing with the legal system, medical doctors, and insurance companies. Many of his clients offer testimonials in the book that he took care of all the details of their claims for them so they could focus on recovering from their injuries. While Dubin can help you if you are injured, all too often, he finds that by the time people come to him for help, they have already made several mistakes at the scene of the accident and directly after it that will make things more difficult for them to get the financial recovery they deserve. That is precisely why he has written Maximizing Your Injury Claim—so people will be prepared when the worst happens to them. He offers practical advice throughout the book, beginning with what to do before the accident so you are prepared and continuing through topics on insurance company red tape, getting doctors to support your claim, dealing with the court system, how to settle out of court, and if necessary, what to expect if your case goes to trial. I learned so much I didn’t know from reading this book. Let’s face it—automobile insurance is something that remains somewhat mysterious to most of us. We pay it because we feel we have to, and we hope we never have to use it, but because we seldom use it, we also usually resent paying for it, so we try to get the least expensive policies possible. Dubin takes us through the maze of insurance policies and explains how spending just a few extra dollars for a better policy can make a huge difference in a time of emergency. He also walks us through the issues involved in dealing with the other driver’s insurance company, what to do if your vehicle is hit by an uninsured or underinsured driver, and what to do if your own insurance company is refusing to pay. He even explores how insurance companies use medical doctors to protect their own interests rather than to help you reach a fair settlement. I can’t imagine there is any scenario Dubin doesn’t cover in this book. He even includes a handy page you can cut out and put in your glove compartment so when you are at the scene of the accident, you are reminded of what information to get and from whom. There are also FAQs sheets for different kinds of accidents, including those involving bicycles, commercial trucks, and motorcycles. Finally, there’s a glossary of terms at the end for quick and easy reference. Being involved in an injury claim is a stressful and upsetting situation, especially if you’ve been seriously hurt. The stress and worry can hinder your physical recovery. Dubin relieves a lot of stress for his readers and clients by helping them to be prepared. He also writes in a very reader-friendly style, leaving out the legalese and explaining everything in plain English. Perhaps what I most appreciated was how he continually included examples to illustrate the information he provided. Every chapter is filled with stories of people who have been in various situations that can arise during a personal injury claim. These stories range from the infamous McDonald’s hot coffee case that most of us think we know but really don’t, to stories of people who have been in multiple accidents so that insurance companies want to claim they have preexisting injuries, to an entire chapter devoted solely to accidents involving children. I can’t say enough about what a valuable book I think Maximizing Your Injury Claim is. Dubin is an honest, straightforward, and caring lawyer who really does want his clients and readers to have the best lives possible. I encourage everyone to read this book. Not only will you then have experienced “the Dubin Difference,” but you’ll be prepared for whatever fate throws your way—after all, preparation is the key to protecting yourself and those you love in times of emergency. Don’t let that quick run to the grocery store that turns into a collision leave you wishing you had read this book sooner. I have known Matt professionally for several years. I have always been impressed with his legal instincts and quick mind. When I read his book it became very clear to me that this is an attorney who “gets it”. He puts clients first! This book is a valuable resource for anyone who has suffered an injury because of someone else’s negligence. Matt takes you through every step of the process. He does this with clarity and focus, using words that the layperson can understand and apply. Matt uses real life examples to draw you in and provide context to his explanations of how the law affects accident victims. I highly recommend this book. Maximizing Your Injury Claim is a very useful book to keep handy. It made me revise my insurance policies to make sure I am paying for the right and convenient one to protect me and family in case of an accident. Easy to understand. He said to hire the right lawyer, and also, that you don't need a lawyer in every case. After an accident, you can't think right, you are in shock. You must prepare NOW, YOU MUST READ THIS BOOK. Educate yourself, it will take only a a few simple steps. Learn about getting medical treatment expenses figured out, about the social media hazards, insurance coverage and what to do at the scene of an accident before the accident takes place. If you are driver or a pedestrian, this book is for you. I know my rights now, what to do in an injury claim and the things you shouldn't do. I keep these steps in a helpful brochure that Matt provided to all of his clients and friends. I am a Private Investigator and Certified Translator, I am thankful to Matthew for sharing his expertise with us in this great book.